Kidney cancer. 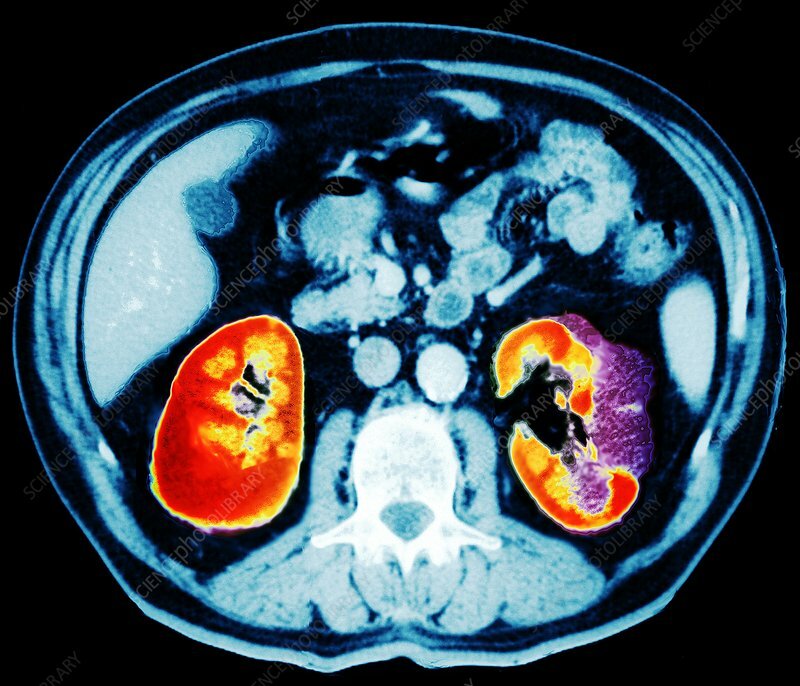 Coloured computed tomography (CT) scan showing an axial section through the abdomen of a patient with a cancer (purple) on the left kidney (lower right). The front of the body is at top in this view from below. The two kidneys (red and yellow) are either side of the central spine (white, lower centre). If still localized, the cancer is surgically removed. The remaining kidney will be sufficient for adequate renal function. If the cancer has spread, or is itself the result of the spread of a cancer from elsewhere in the body (a secondary cancer), then chemotherapy is required. Parts of the liver (upper left) and intestines (upper centre) are also seen.